You’ve heard of the 10 Days of Xmas? How about the 21 Days of Thanksgivukkah? In honor of the five-year anniversary of my first book, Cool Jew: The Ultimate Guide For Every Member of the Tribe, and the rare event known as Thanksgivukkah, the confluence of Thanksgiving and Chanukah (how ever you spell it), I’ve teamed up with a few other cool Jews to gift everyone craving a little more shmaltz with their turkey. For 21 days, we are giving away copies of Cool Jew together with Mama Doni’s “Ruach” CD and a $10 gift toward a $50 purchase at ModernTribe. But that’s not all… Because the next Thanksgivukkah won’t come around for another 79,000 years or so, on Nov. 25th, just in time for Thanksgivukkah on Nov. 28, one lucky winner will score a whopping prize package valued at more than $700, including copies of both of my books, Cool Jew and it’s partner, newcomer Hot Mamalah: The Ultimate Guide for Every Woman of the Tribe. This grand prize also includes your choice of a pair of Keen Footwear and bag (total value at $300) and ModernTribe’s Thanksgivukkah t-shirt and No Limit Texas Dreidl Game. The winner also takes home Mama Doni’s new “Jewish Holiday Party” DVD/CD set and her “Get Cooking: A Jewish American Family Cookbook” written with Rachel Harkam. Two more CDs feature Sam Glaser’s “Rockin’ Chanukah Review” and “Soul Daughter,” the new collaboration from Neshama Carlebach and Josh Nelson. 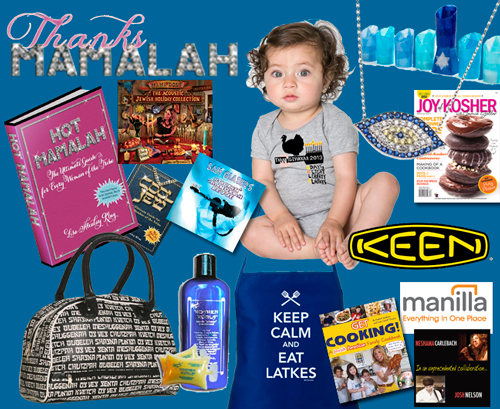 Last but not least, there’s Alef Bet Judaica’s beautiful bling necklace, a Kiwi Crate DIY Hannukkah Crate, a one-year subscription to Joy of Kosher magazine, Rabbi’s Daughters Yiddish travel bag and Rotem Gear’s “Keep Calm and Eat Latkes” apron. For Jewfro fans, there’s even a bottle of Kosher Kurls. Top it all off with a Manilla.com t-shirt, umbrella and tour of Manhattan’s Hearst Tower, another outlet where I write each month as the Bargainista. (Sorry, travel to NYC is not included.) All you have to do is enter to win! No purchase necessary, for residents of the U.S. and Canada. All the other standard yahda yahda yahda stuff applies. So, get clicking… enter to win and have a wonderful Thanksgivukkah–a very beautiful Festival of Lights and an uber-joyous Thanksgiving. Next Story → Where do we go from here?